Tops for women. Clean designs. Easy wear. Silk & linen. Announcement Welcome to my studio! I love to be creative. Everday! The clothing I design for women are stylish, have clean and simple lines, are very comfortable and easy to wear, and are made in OneSize and OneSize+. They have a little personality, are a relaxed look and, are the kind of garments that one finds themselves reaching for over and over. Whether curling up on the couch for a relaxing Sunday afternoon, or going to work, then out for dinner with friends, my designs work well for many occasions. Over my many years as a professional dressmaker and designer, I have heard the comments women make about the kind of garments that are out there, and how hard it is for them to find something that works for them. While my designs are not a panacea for every occasion, they do fulfill a broad niche - that of a flattering look that fits most figure shapes, interesting design details, comfortable fabrics, and very wearable. So, how did I get to where I am today, artistically and professionally? My passion for fabrics, sewing and design, and artistic expression has been life long. At the age of 7, my mother taught me to sew. She would take tailoring classes and then show me what she learned. As a result, by the time I reached the age of 12, I was making little Channel styled suits for myself. My formal education continued in college, where I earned a degree in Clothing and Textiles. Shortly after college, I was invited to give a presentation in sewing and fashion, at a local school. I put on a one woman show, modeling an extensive wardrobe that I had designed and constructed, while talking about the construction techniques, and how to coordinate wardrobe pieces around some standout basics. The teacher of that class shared with me later, that she had never seen so many of her students get so fired up and excited about sewing! In addition to teaching sewing, I also worked for Butterick pattern company traveling the United States putting on educational one woman fashion/sewing education shows. Eventually, I began my own business, traveling the west coast, presenting sewing education workshops in fabric stores. After I moved to Seattle, I began a business in dressmaking and alterations. My specialty has become bridal gown designing and bridal alterations. I love working with such beautiful fabrics, and I find it immensely satisfying to work through the complexities and challenges of designing and altering wedding dresses. All this being said, I have had years of experience fitting countless sizes and shapes of bodies and have worked with many, many different kinds of fabrics. I have learned a lot about what women are looking for in clothing, fit, and style. This has led me to create a line of tops and accessories for women, designed specifically to address some of the problems of style and fit that women encounter. In my studio, you will find beautiful garments with clean, interesting design lines, that have a relaxed and comfortable fit. 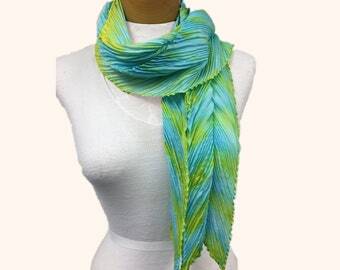 In addition to women's tops and tunics, I also create shawls and wraps, scarves ,and home decor pillows. I have made the tops and tunics in One Size and One Size Plus, both of which will fit most figures. My intention in designing these tops, is to make a relaxed, comfortable fit that drapes nicely over the body, and, - bonus! - also helps hide or minimize the tummy and upper arms. These tops and tunics are versatile and great for layering, and can be worn to work, out to dinner with friends, as casual wear, and, I even have a couple designs suitable to wear to the beach! Many of my scarves, wraps and shawls I have hand painted on luxurious charmuese, chiffon, crepe de chine, habotai, and organza silks. 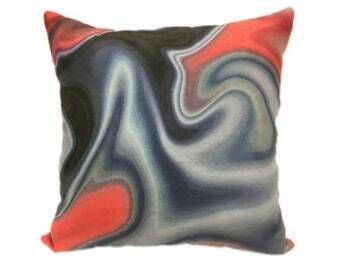 Some of the fabrics I use have been designed by me from photographs I have taken, then heavily edited in Photoshop, to yield unusual and appealing patterns for clothing, and home decor pillows. I also work with other natural fabrics and fine synthetics in my collection, as the creative mood strikes me. Working with fine quality fabrics is vastly preferred by me, even though more expensive, because they provide such beautiful hand and drape, they feel better against the skin, and the colors and patterns are more unique. It is also a joy to use special, and often couture, sewing techniques in my construction, some of which can be time consuming. It is my intention to offer the best fabrics and construction techniques in the creating of my line of garments. Some I consider art to wear pieces. It is my hope that these one of a kind items can become a valued core piece in your wardrobe. It's been a few months since I opened my Etsy studio, and already I find my work evolving. I am currently designing and sewing with linens. I find linen a very comfortable fabric to wear, easy to care for, a long lasting fabric which only gets better with each washing. I prewash the linen in order to take care of the shrinkage before I cut and sew the fabric. Prewashing also gives the fabric a softer hand, which feels great next to the skin. Though linen can wrinkle, the prewashing helps make wrinkles softer instead of so crisply creased. And, with each washing, more of the personality of the linen comes out. Being creative every single day is what I do. The things I learned from my mother about aesthetics, the importance of creative outlets, and the importance of learning something new every day, continues to inform my life. While my creativity takes many forms, each medium feeds the next, and it almost always takes me back to the designing of clothing, fabrics, and color. I am always willing to explore and open myself to whatever next captures my creative attention, and see where it leads me. I hope you enjoy wearing these items as much as I enjoyed creating them! Welcome to my studio! I love to be creative. Everday! 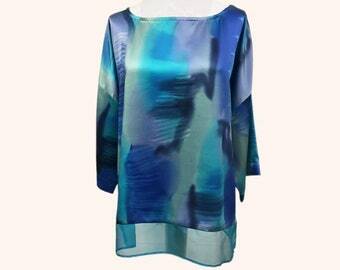 Watercolor-like print tunic/top in shades of blue. Chiffon vented hem band. 3/4 sleeves. Polyester charmuese fabric. One size. Handmade. Hand painted shrug or cover-up. Silk habotai. Scarf. Aqua, shades of green, yellow. 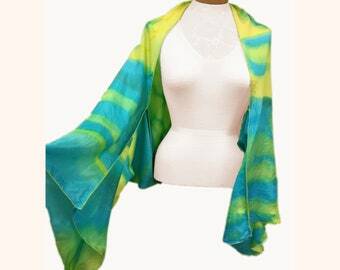 Turquoise silk chiffon poncho. Silk satin border trim. Boat neckline. Side seams established with short seam. One size fits most. Handmade. 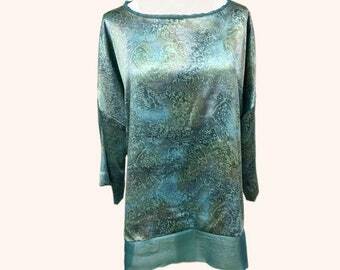 Beautiful silk charmuese tunic/top. 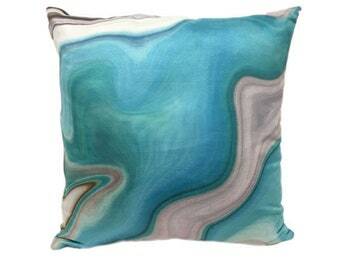 Aqua/celadon green/blue/topaz print. Loose, relaxed fit. One size. Handmade. Striking abstract print silk chiffon wrap. Wear it multiple ways. Detailed with contrasting magenta rolled serged edges. One size fits most. Infinity scarf. 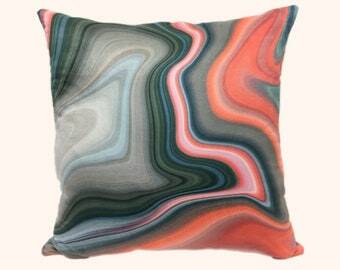 Ombre silk charmuese. Shades of blue. Luxurious. Versatile. Hand painted silk Arashi Shibori scarf. Silk crepe de chine. Shades of sky blue and yellow blending into shades of green. Handmade. Silk/rayon burn out oversized wrap. One size fits all. Neutral latte colored floral pattern with bits of aqua and bronze. Handmade. 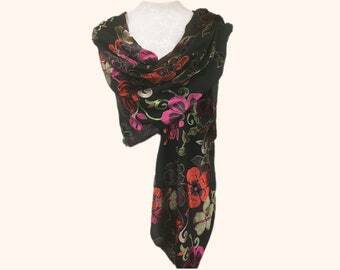 Stunning burn out rayon and silk velvet floral shawl. Lined with china silk. Can be worn many different ways. A real show stopper. Handmade. Asymmetric poncho. Warm wool and acrylic. Vintage button details. Purple/blue and charcoal and cream plaid. Handmade. 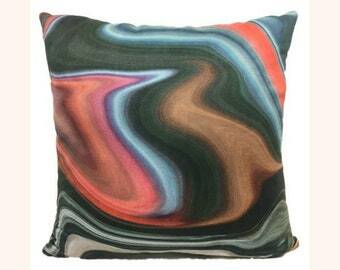 Faux suede home decor pillow, backed with linen, bottom zipper. 18 x 18 inches. Custom designed fabric. Handmade. 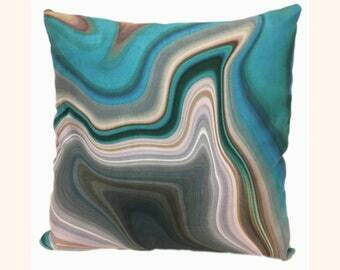 Faux suede home decor pillow cover. Backed with linen. Bottom opening zipper. 18 x 18 inches. Custom designed fabric. Handmade. Faux suede home decor pillow cover. Backed with linen. Bottom zippered opening. 18 x 18 inches. Custom designed fabric. Handmade. Faux suede home decor pillow, backed with linen. Bottom zipper. Custom designed fabric. 18 x 18 inches. Handmade. 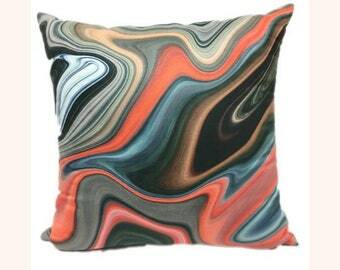 Faux suede home decor pillow cover. Backed with linen. Bottom zipper opening. 18 x 18 inches. Custom designed fabric. Handmade. I have spent much of my working life as a professional dressmaker. Over the years, I have noticed a need for versatile, attractive, easy wear tops that have a relaxed fit for comfort and are flattering to most women’s figures. The tops and wraps I create are universal in design and appeal. They are designed with both slim to fuller figured bodies in mind. They are meant to make the wearer feel attractive, while helping to hide the belly and upper arms. 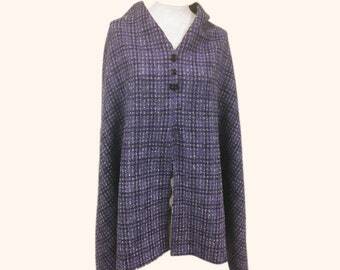 The tops, wraps, cocoon jackets, and tunics, have clean simple lines, flow over the body attractively. They are versatile enough to layer with a camisole and jeans, or to use as beach wear, causal wear or, for dressier occasions. Many of my garment are meant to be 'art to wear' core pieces. Enjoying many forms of textile art, I also paint silk scarves, and use the Japanese art of Shibori; a form of folding, clamping and tying fabric, that when dyed, create places on the fabric that resist the dye, resulting in some really interesting patterns. Within the last couple years, I began exploring digitally manipulated photography. I go out into the world and photograph anything and everything. Then I take selected photographs and do some extensive editing in Photoshop, which results in completely transforming the photos into unusual and unique abstract images. The Photoshop files are then sent off to a digital fabric printing company. They print my images on the fabric of my choice, and I use that fabric for making some of my tops, wraps, pillows, and more. In addition to hand painting and digitally designing my own fabrics, I do also buy fine fabrics, many of which are name brand designer’s mill ends, for use in my line. I fully expect and look forward to seeing how this fledgling collection of garments will evolve and change over time. So, stay tuned for what will come next! I absolutely love the creative process and am grateful to be able to practice these forms of art. I hope some of my designs make their way into your closet, and that you enjoy them for years to come. All of my clothing designs are minimalistic and loose fitting. OS = One Size. This size typically fits a bust measurement of 34 - 42 inches. I provide the sleeve length, height of the garment, from the top of the shoulder to the lower edge, and the circumference of the garment. Measure the widest part of your body and add 4 - 8 inches. This will give you the ease you need for a loose, comfortable fit. For instance, if your widest measurement is 40 inches, you want the garment to be 44 - 48 inches in circumference. Please contact me if you need help with sizing, or have any questions. I'd be happy to help you. Any wool, silk (chiffon, charmuese, crepe de chine, satin, etc.) should be dry cleaned. However, some silks can be hand washed, or machine washed delicate (please put the garment in a lingerie bag before putting it in the machine). Then line dry the garment, and before it is completely dry, while a little damp, press it with medium heat, on the wrong side. Other natural fabrics and synthetics can be machine washed cold and tumble dry on air. NOTE: In the description of each item, I will state the care of that specific item. Each item is carefully wrapped in tissue, and placed in a bubble bag, or sturdy shipping box, depending upon the size of the piece. Care instructions will be included.